Gift the gift of the OUTDOOR RELAXATION! ​Water repellent, puncture resistant and extremely compact. At 63in X 44in (160cm X 110cm) it's large enough for 2 to relax or more to sit. So go ahead, put yourself out there. Buy a gift that promotes Healthy Travel! ​A Healthy Back Bag® is the perfect combination of fashion and function, making style effortless. Designed to mold to the shape of your spine, minimizing the strain on your back, neck and shoulders. 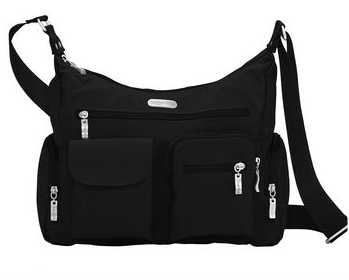 Cleverly designed pockets inside and out mean your stuff is organized the way you want it. Give a gift that's perfect for on-the-go! Give a gift that helps reduce wrinkles! 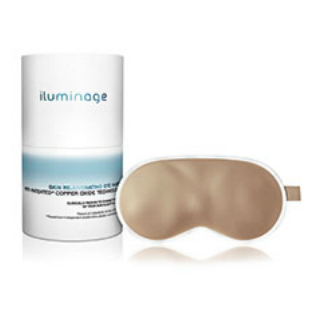 ​This copper-infused sleep mask covers eyes with advanced care to minimize the appearance of fine lines and wrinkles as you sleep. Beyond blocking all visual stimuli to quiet your mind and senses, this silky, soft, smart textile is carefully embedded with Cupron's copper oxide technology, derived from a well-known essential mineral. This technology is clinically proven to reduce the appearance of wrinkles for smoother, younger-looking skin in as little as four weeks—with a continuous effect over time. This sleep mask is perfect for those long haul flights! Give the gift of SUN PROTECTION! Looking for a gift for a loved one that loves to travel? Colorescience has developed a unique product that is a water resistant, broad spectrum sunscreen that makes protecting skin easy, 365 days a year! The Sunforgettable brush makes the perfect travel companion that is easy to reapply and it offers powerful SPF 50 UVA/UVB protection with sheer, natural-looking coverage! Keep your loved ones protected with this award winning product. Give a gift that helps track HEALTH! After traveling in germy planes or trying a new exotic food – are you feeling under the weather? 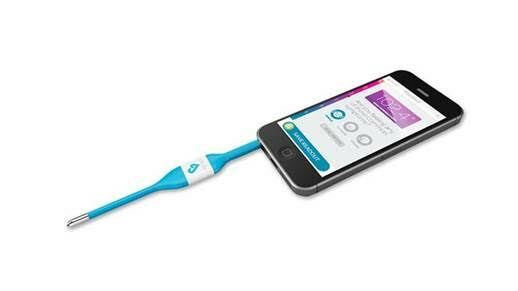 It’s easy to track family member’s symptoms and temperatures to share with your doctor – plus the stick is so lightweight and flexible you can travel with it in your carry-on, purse, or in a side pocket of your luggage. Just plug in the Kinsa directly into your smart phone’s headphone jack and with a few taps, you can store your symptoms, temperature readings and make notes. Give a gift that helps keeps you HEALTHY! The Everyday Travel Pack is a convenient travel/gift pack containing Sierra Sage Herbs Everyday Salve products. The pack includes Citrus Zest and Cool Mint lip balms and a tin of Skin Repair, Dry Skin Care, and First Aid Green Goo. 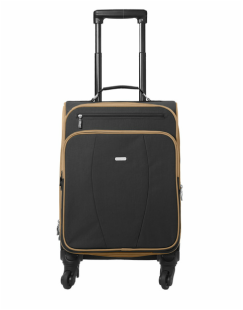 It makes an excellent gift for Travel! The Original Myllow Travel Pillow is the most functional pillow on the market. It helps support your head and neck while resting in either an upright or reclined position. The level of volume can be varied to meet your individual needs-low, medium, or full. Myllow can be adjusted to fit the unique shape and curves of the user. Your Myllow will mold to your individual shape and alleviate any pressure points. Pull the drawcords and stoppers in opposite directions and the micro-bead filled pillow sides increase in volume to the amount of neck and head support you need. Giver her the gift of SPARKLE! She'll pull holiday sparkle out of her handbag with this giftable double mirror compact. Red and clear crystals form chevron stripes on the top, and inside is a regular and a magnifying mirror. Comes in a clear plastic gift box with a red ribbon loop to hang as an ornament. Give the gift of make-up ORGANIZATION! 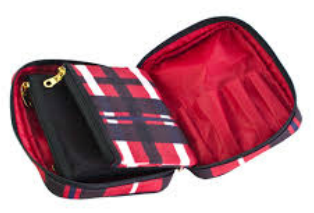 The Tartan + Twine 3-piece Beauty Organizer is compact, yet versatile. 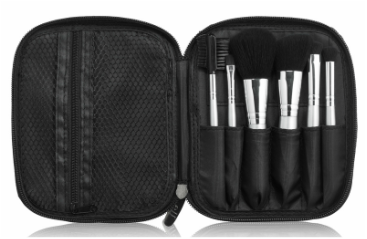 It zips open like a book to reveal two detachable pouches, a makeup brush organizer and side zip-pouch. Remove the two center pouches if you need more room. Its thin, sleek design also makes it versatile enough to use as a clutch. Made of red, white and navy plaid nylon. Vivitar's DVR 786 HD Action Camera allows you to record amazing footage from your point of view! Designed with the sports enthusiast in mind, the DVR787 is one of the most versatile digital video recorders ever made. The HD Action Camera is waterproof and includes a bike/ATV mount, so you can film the action of your extreme excursions. Lightweight and compact, the video recorder will not impact your performance or constrain your movement. The DVR 787 delivers full 1080p High Definition video quality at 60 fps and features a waterproof case and remote control. From surfing and skydiving to biking and snowboarding - never miss a chance to document your adventures again!